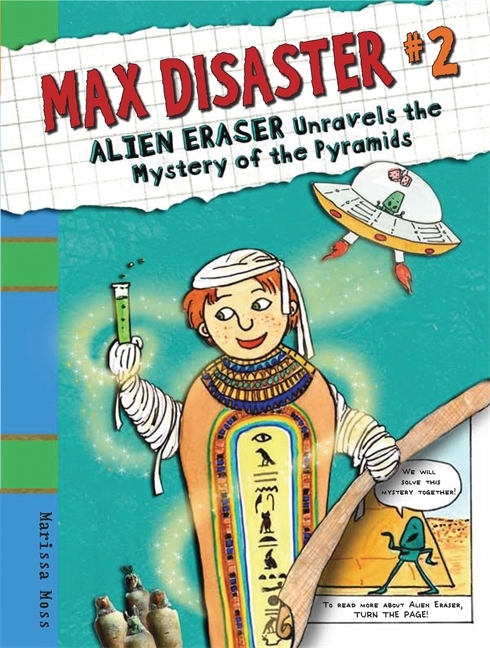 INTRODUCING A NEW SERIES WITH MAX, HIS NOTEBOOK, AND HIS BEST INVENTION, ALIEN ERASER! 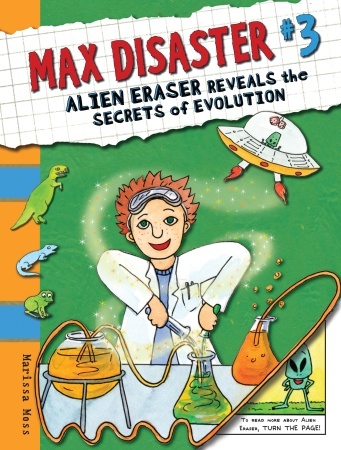 OR DID ALIEN ERASER INVENT MAX? 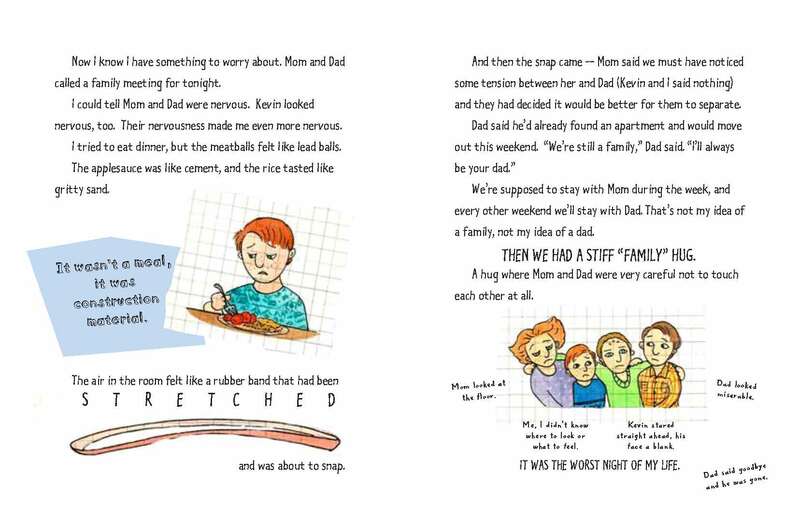 FOR THE TRUE STORY, LOOK FOR THE NEXT ISSUE OF ALIEN ERASER, COMING YOUR WAY IN MAY 2009 FROM CANDLEWICK PRESS! HERE ARE SOME SAMPLE PAGES FROM MAX'S NEW BOOK. Max grapples with the outrageousness of divorced parents beginning to date - and other mysteries of evolution - in his third quirky notebook. 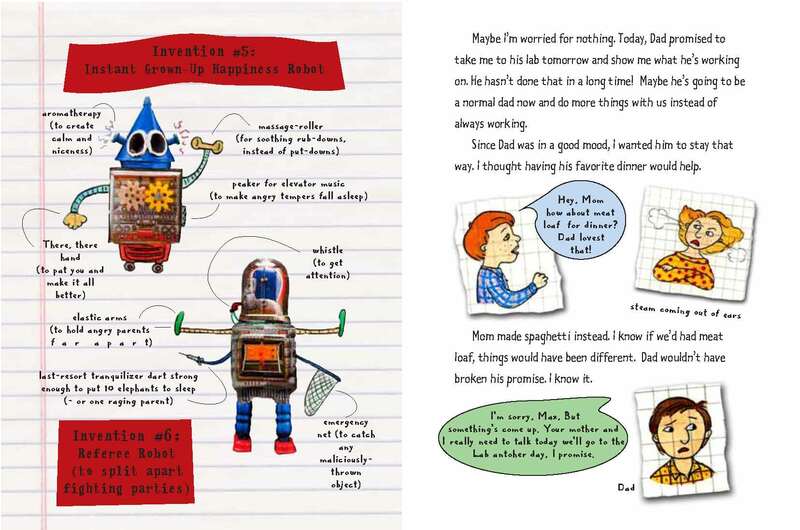 Welcome to Max’s book of inventions, experiments, comic strips, and random thoughts about school, the universe, evolution, and parents who definitely don’t act the way parents are supposed to act. Luckily for Max, he has a place to jot down his biggest questions and most amazing discoveries. This zany mix of comics, concoctions, and contraptions helps Max tells the story of his topsy-turvy life and how he comes to terms with a changing family. Did aliens build the pyramids? Will a magic love potion bring Mom and Dad back together? And what do school science, mummified apples, and alien erasers have to do with it? In a second zany, jam-packed graphic novel, Max jots down his worst fears and best brainstorms. Pimply older brothers. Good parents who get into bad fi ghts. Lucky for Max, he has a place to jot down his mixed-up thoughts and brilliant ideas. In a quirky mix of comics, concoctions, and contraptions, Max tells the story of his topsy-turvy life -- and how he tries to hold it and himself all Together. Welcome to Max’s secret collection of inventions, comic strips, and random thoughts about school, family breakups, and the power of Alien Eraser.